This may be a bit of a stretch for Illustration Friday’s topic, but who among us doesn’t walk through the valley of the shadow of death (& taxes), at least some of the time? After all, they’re ineluctable! This is yet another painting in the series I’ve been working on, whose purpose will be revealed soon. (Although anyone who tries can figure it out with very little effort.) 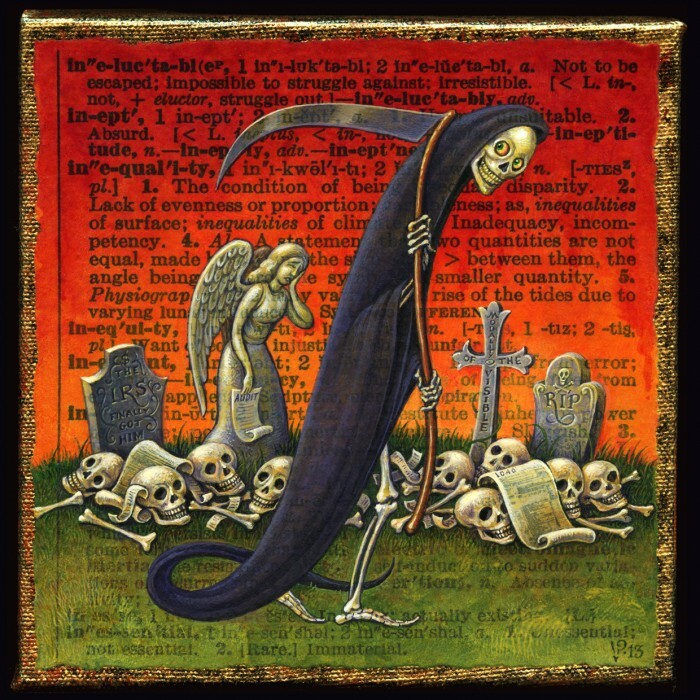 In addition to invoking the Grim Reaper and the IRS, it includes an ineluctable nod to James Joyce, though you may have to click on the image to be able to read it. Confession: this painting was intended for my Halloween post, not Thanksgiving! But that week I was visited by a monster of a fever, & rather than getting in the holiday mood by painting Death, I got to feel like death warmed over. The good part is that, now that I’m finally healthy again, just being able to walk around doing everyday tasks without feeling like a zombie makes me feel grateful every minute of the day, so I’m going to be very ready to give thanks tomorrow! I’m also enormously grateful to every one of you out there in Internet Land who visits this blog. I never thought it would be possible to feel so close to people I’ve never met, but internet magic makes it so. You encourage & inspire me, you make me smile & laugh, sometimes you even make me cry (in a good way). THANK YOU from the bottom of my heart! This entry was posted in A Word A Day Illustrations, Prints Available and tagged Acrylic, Art, AWAD 2013, Bones, Cemetery, Death, Gravestones, Grim Reaper, Illustration Friday, IRS, Red, Shadow, Skulls, Taxes on 27November 2013 by Leah.